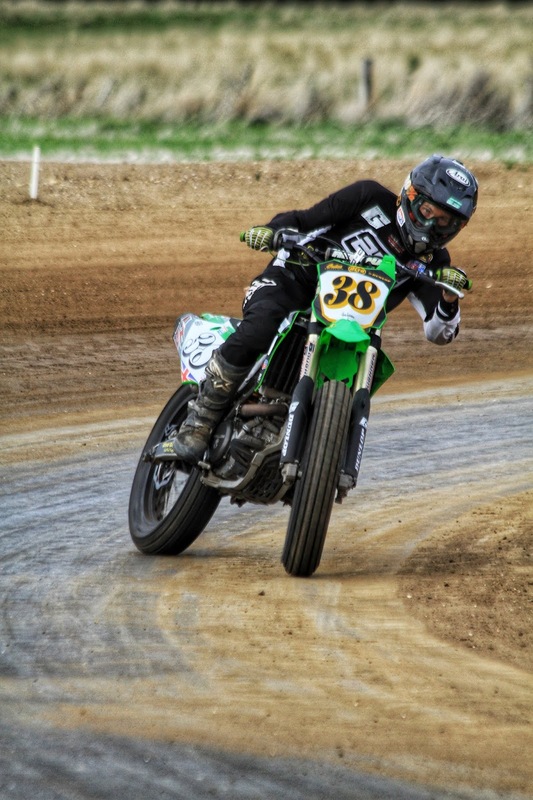 The final round of the Indian Motorcycle Flat Track Nationals presented by the DTRA was held at our home track, Greenfield Dirt Track. For the season finale we would be racing the oval, having already raced the TT track earlier in the year. 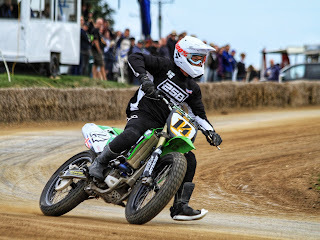 Whenever Greenfield is hosting a round, George Pickering is always flat out in the run up to the event, but his hard efforts don’t ever go unnoticed, especially this time around- the track conditions were perfect and made for some of the best racing we’d seen all season. 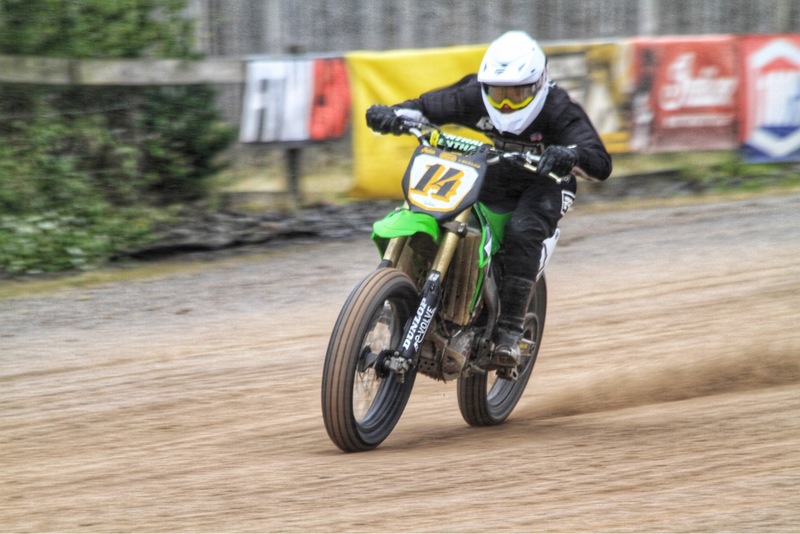 It was also great to see so many local people come out and support the event and get a real taste of what Flat Track racing is all about. The event was spread out over the whole weekend, with the Pros/Inters, Hooligans and Youth Seniors taking to the track on Saturday. The much-preferred qualifying format kicked off around 1pm on Saturday afternoon. With the Spaniard Gerard Bailo topping qualifying with a rapid 16.264 second lap time in his second qualifier. 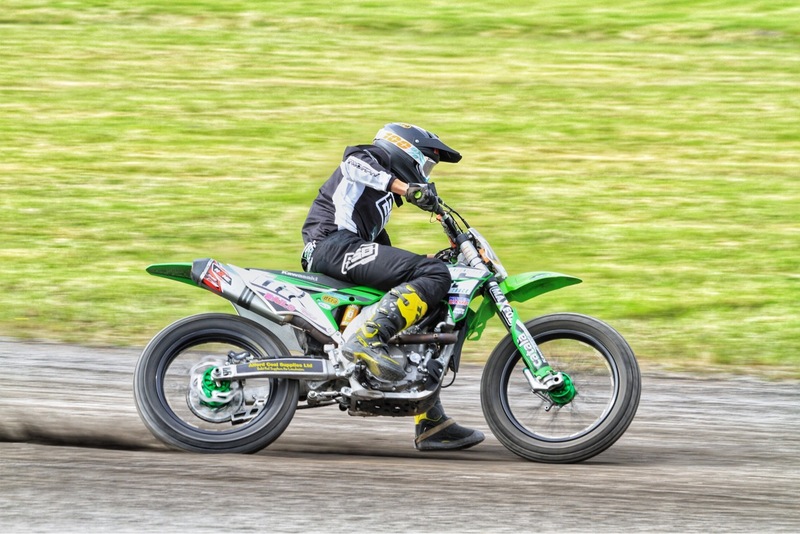 Pickering also looked faultless riding his groove and clocked in 16.568 seconds, on the second lap of the first qualifying session- placing him fourth for the upcoming heat races. From his qualifier Gerard took the first grid pick for his heat race, leading this heat from the green light till the chequered flag and pulling six seconds on Mike Hill, who finished second to Gerard. Thanks to his fast time in qualifying Pickering also had first pick of the grid, opting for the inside of the front row. Holeshotting, Pickering showed the rest of the field the way round his track and cruised to his first win of the day. Bailo transferred straight to the first semi-final and lined up against tough competition Toby Hales and Gary Birtwistle on the front row. After making a cracking start and firmly being part of the leading pack, much to the rider’s frustration the race was red flagged due to an accident and set for a full re-start. Again, Bailo was able to fight it out with Hales for the top spot, but on the penultimate lap the semi was red flagged due to another incident, this time round the race was too far gone for a re-start and Bailo had to settle for second to Hales. Pickering took to the track in the second semi-final, lining up alongside Maikel Dijkstra, who had been looking on pace all day. Pickering again opted for the inside line of the front row and shot off like a bullet to take the first corner, again not to be beaten he comfortably took the semi win. Pickering’s faultless riding lead him too first pick of the grid for the final, he stuck with what had been working and went for the inside of the front row. Bailo on the other hand wasn’t so lucky with his final grid position, lining up on the middle row with the first pick. Pickering made it three out of three with another holeshot in the final, leading the pack coming out of the first corner. Meanwhile Gerard battled his way through the pack of riders, trying to get himself in on the action of the front runners. 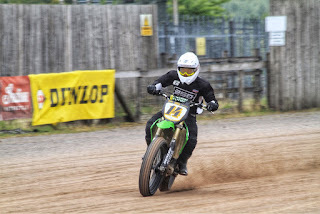 As the race progressed, Pickering looked comfortable out front but around seven laps into the fifteen-lap final Gary Birtwistle and Bailo began to catch up to his fast pace. Birtwistle boldly went around the outside of Pickering as he exited the second corner, two laps later coming into turn three Bailo made a move on Pickering, moving himself up to second and Pickering down to third. Gerard wasn’t going to settle for second though, he seemed to up the pace a level and relentlessly pursued Birtwistle, passing him hard up the inside on the twelfth lap. Then Gerard did what Gerard does best, settled into the groove and rode the remainder of the race as it was his own, crossing the line nearly a whole second ahead of Birtwistle. Pickering cruised to the finish line in a well-deserved third place, riding the rest of the race unchallenged. 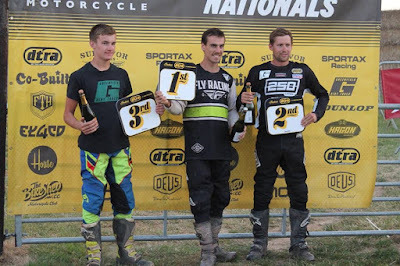 Gerard Bailo was the winner of the season finale, on a magnificently grooved up Greenfield Dirt Track, with his team mate George Pickering joining him on the podium in third place. Supporting the Pro racing on Saturday afternoon were the Youth Seniors. Max Inman raced his KXF-250 for the final time this season and without a doubt brought some of his best riding to the track for the season finale. 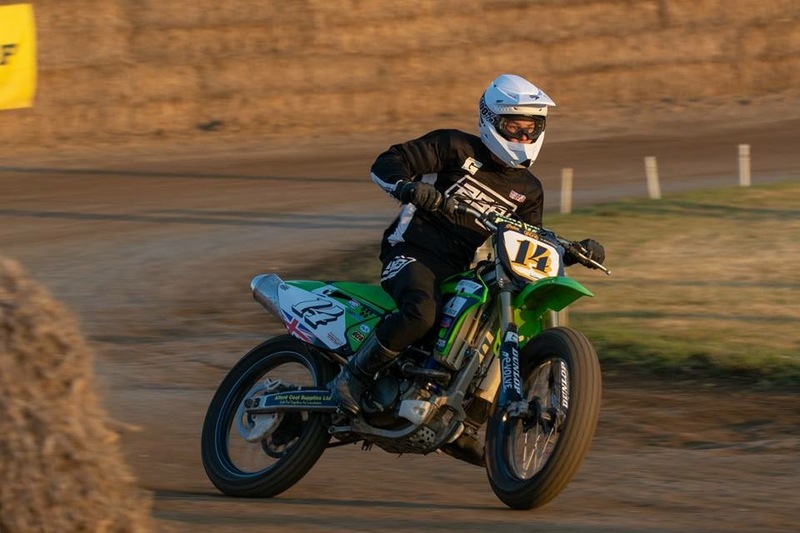 Securing two second place finishes in his first two heat races, Inman raced like a pro with impressive lap times in the low 17 seconds, which would have secured him mid-pack qualifying in the Pro/Inter class and on a 250! Max remained determined throughout the course of his first two heat races, ensuring that Bell didn’t run away with the race. It was clear though that Inman’s biggest struggle is his starts, difficulties at the start of the third heat race meant he was stuck behind the #9 of Archie May, despite being more on pace than May, Inman struggled to find the right line to make a bold pass, as the last lap flag waved him on he knew it was now or never. On the entry of the final corner Inman tried to slip up the inside of May, but May wasn’t budging, and Inman had nowhere to go and could feel the bars hitting the floor, resulting in a high side as he tried his hardest to miss May. Max walked away from the crash and the way we’re looking at it is that it’s a positive to see Inman so driven that he tries to make a bold move, this is huge progress from the start of the season, it’s great to see Max pushing himself and his abilities- it shows how badly he wants this. The double points final saw Inman finish in third behind Bell and May, this time riding safely for the points, avoiding a DNF. Again, its clear from the lap times that Inman was well on the pace and just struggled to get past May, as he crossed the line just 0.174 seconds behind May. 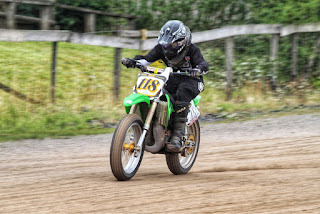 Some brilliant riding from Max and so much improvement as the season progressed, it was also great to see Max put up a fight in Saturday evenings minibike barn stormer, holding his own alongside some of the best riders in the UK Flat Track scene. Nice work Max. 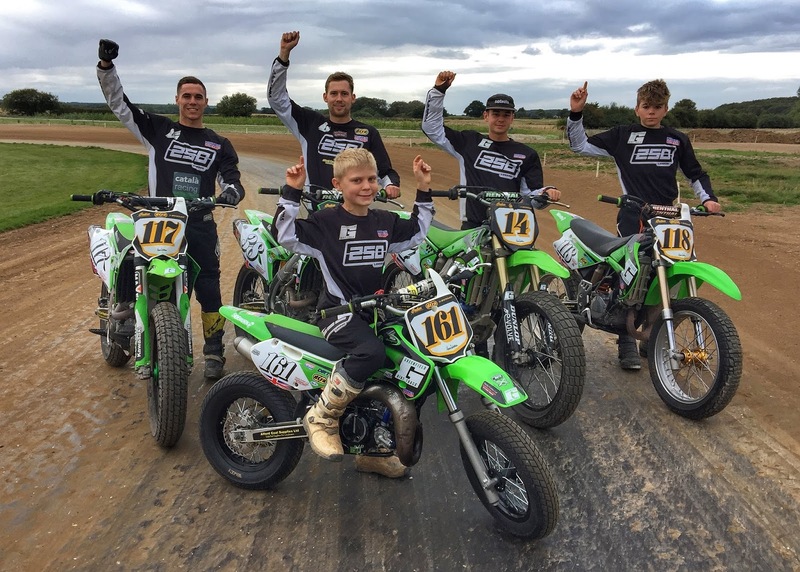 Fergus Bluff raced his KX85 for the last time ever on Saturday in the Youth Intermediate class. Well on the pace as ever Bluff looked effortless racing at Greenfield, cruising to a second place in a very talented 85cc class. In his next two heats Bluff took the win, with a particularly impressive ride in the final heat after a poor start Fergus made his way up to the front of the pack and with a last lap around the outside manoeuvre, he passed Arran Scott to take the chequered flag, in a nail biting heat race. Unfortunately Fergus didn’t make it off the line for the double point final- his bike nipped up on the start line, we will be stripping it down this week, to see what damage has been done. Fergus will move up to the Youth Senior class next year, we look forward to seeing him out in the 250cc class. 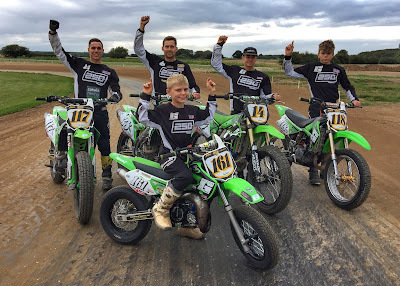 The Youth Junior class had its biggest entry all year at Greenfield, with eleven bikes lining up on the grid, with everything from 50cc auto's to 65’s out on track. Toby Johnson was in good spirits for this final race of the season and secured a fifth and two sixths in his heat races. 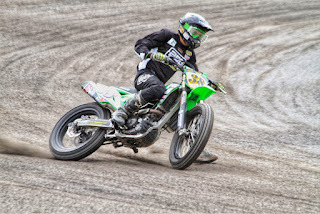 Then finishing fifth in the final out of eleven riders. Some great progress from Toby, he showed a lot of confidence making passes as the race progressed. The weekend at Greenfield was a huge success from all aspects. The Team had another cracking result and George’s track was faultless, the whole weekend ran smoothly and there was some of the best racing all season! Most importantly a lot of riders had a lot of fun and this projected onto the whole atmosphere of the weekend long event. A special congratulation must go to Gerard Bailo, who is the runner up in the British Flat Track Championship, with George Pickering finishing in fourth. 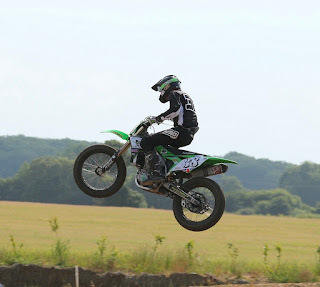 Then Max Inman for finishing third in the Youth Senior Championship. We are just waiting for confirmation of the final championship position of our other Youth riders. We would also like to say a massive congratulations to our good friend and local rider, Toby Hales, who has been helping us out a lot behind the scenes this year- on winning the 2018 British Flat Track Championship. From all at Team Greenfield we would like to thank everyone who has sponsored, supported and contributed to the team this season. It wouldn’t be possible without any of this and really has been a team effort. We hope that we can push on again next year and achieve even more great things. Dirt Track Rider Association, Noyes Camp, 250London, Sideburn Magazine, DirtHub, Duck Smart, Motoshack, Alford Coal Supplies, Hanby Estates, Motul Libèrica, None Racing, Wheel House Tyres. Steve Nichols, Adri Bailo, Toby Hales, Freddie Hales, Matthew Traves, Leah Tokelove, Paul France and the Pickering family. Words from Leah Tokelove and thank you to Paul France for the images all season. Round five and six of the Indian Motorcycle Flat Track Nationals presented by the Dirt Track Riders Association saw Team Greenfield make the 528-mile round trip to Amman Valley Trotting Track, nestled in the South-West of Wales. 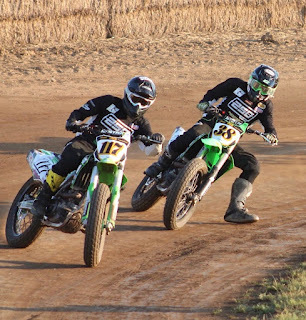 This double header is always set to be a spectacle with the half mile track providing some fast paced racing. However, in the week leading up to the race weekend the forecast looked grim, with much being thrown up into the air as to whether or not the race meeting would actually go ahead. On the Friday morning Anthony Brown made the decision to go ahead with Saturday’s race, so the Team could begin their journey down to wet Wales. 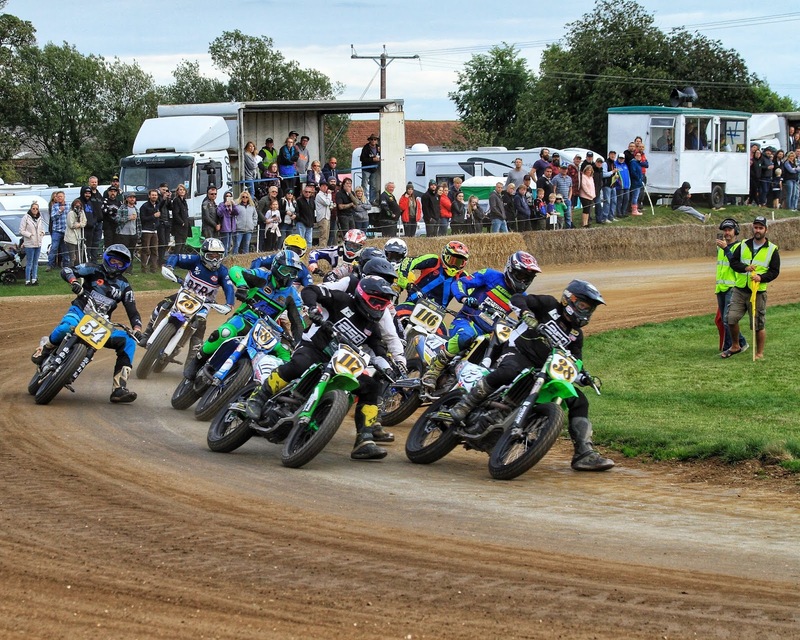 Owing to the nature of Amman Valley and time constraints over the weekend the racing reverted back to the original format of three heat races, with the score from these heat races being combined to give the rider their grid position pick for the final. 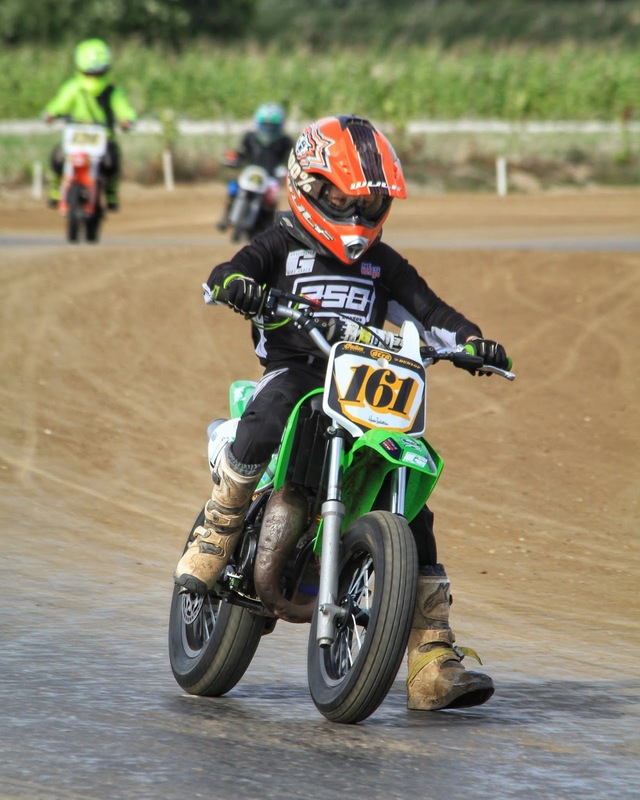 The race meeting got off to a positive start for Team Greenfield despite the poor weather. 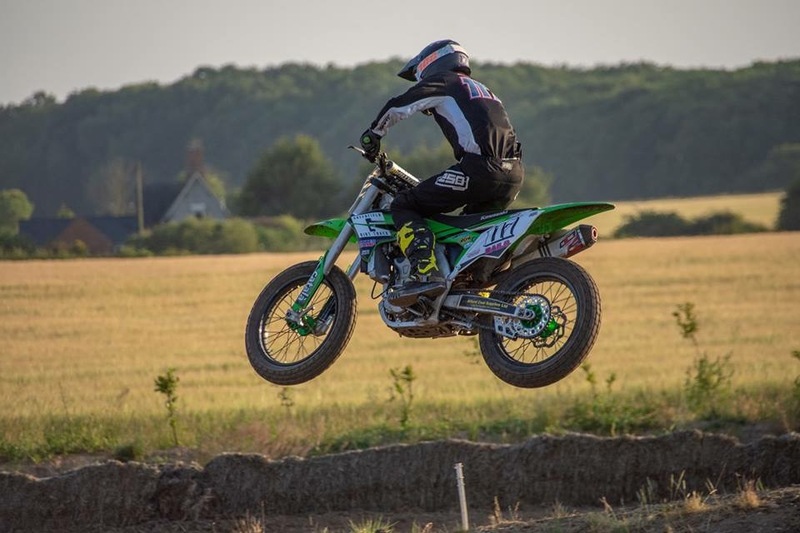 Pickering started from the back row and after an impressive start which saw him ride hard around the outside of the first corner he jumped up to fifth position. 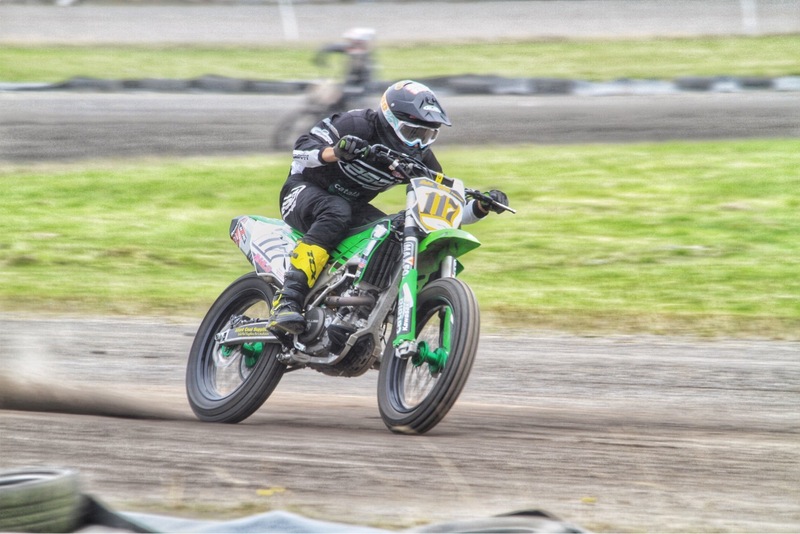 He continued to battle his way through the pack up to third positon, where he faced increasing pressure from Dutch rider Dijkstra, who just pipped Pickering on the line for third place, with 0.003 seconds in it. Gerard Bailo was up in the following heat after taking his place on the front row for his first start of the day. Gerard was impressive leading from the green light to chequered flag and to say the Spaniard doesn’t often ride long tracks, he racked up the third fastest lap time of the day with 25.115 seconds. In Pickering’s next heat he lined up on the front row alongside the #116 of Sam Hurst, again Pickering made an excellent start, driving hard off the line to beat the pack into the first corner. Pickering led the #116 of Sam Hurst and #500 of Mear comfortably, crossing the line in first position and clocking his fastest lap time of the day with a 25.517 second lap. Bailo’s second heat of the day was to be a toughly contested one. Lining up on the middle row of the grid, behind the two fastest riders of the day Toby Hales and Maikel Dijkstra, who would be setting off from the front row. Bailo was able to hang onto the back of Hales and Dijkstra, the three riders began to pull away from the rest of the competitors. It soon became clear that Hales meant business when he clocked a 24.978 second lap, edging that bit away from Dijkstra and Bailo. Bailo was able to cross the line in third place, 0.903 seconds off second place Dijkstra and 1.211 seconds in front of fourth place Gary Birtwistle. 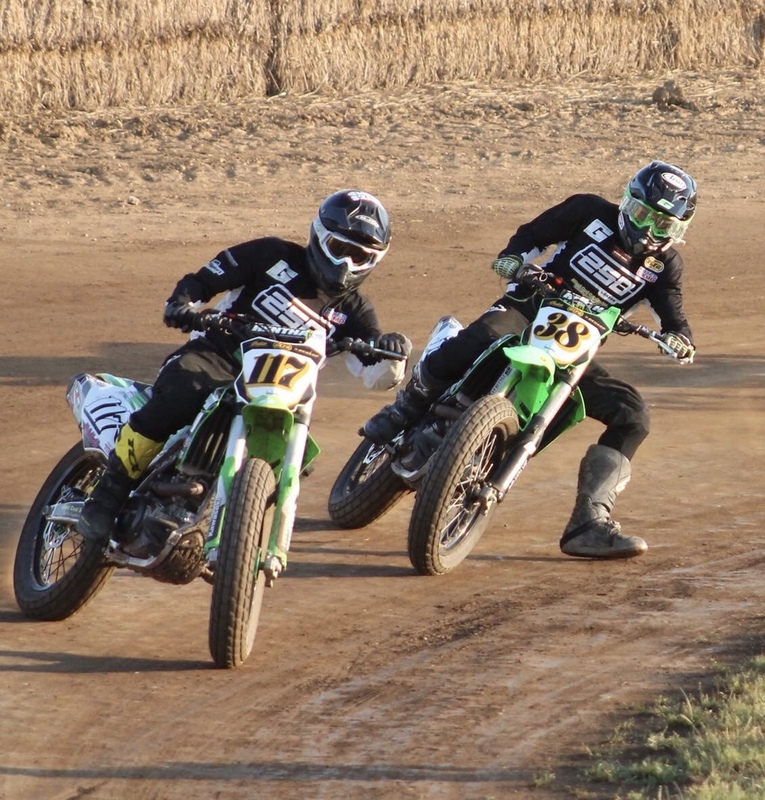 The third and final round of pro heat racing, again saw the two Greenfield riders in separate heat races. Pickering was up first, with his middle row start. Richard Mason was able to make a cracking start from the front row, with Hales working his way round the pack from the back row and Pickering holding on tightly to the second place of Toby Hales as they completed the first lap of racing. Hales increased the pressure on Mason as the race progressed, with Pickering sitting on the back of these two waiting for his chance. As Hales worked his way past Mason, Pickering was then able to increase the pressure on Mason, trying to find his way past him. Mason was proving difficult to pass and the laps clocked on, Pickering crossed the line in third place 0.443 seconds behind Mason, with another lap Pickering would have had the opportunity for advancement. The pace was fast In Pickering’s final heat, Pickering crossed the line 1.751 seconds ahead of fourth place Mear. Pickering’s point tally from his heat races earnt him fourth pick of the grid for the 12 and a half lap final. Bailo was up next in his final heat race of the day, starting from the back row. After the first lap Bailo was able to move up to third position, behind the #75 of Paul Young and the race leader #581 Dijkstra. Bailo showed a fast pace mid corner, allowing him to drive out fast and increase the pressure on the #75 of Young. Bailo hunted Young down over the next lap and was able to come out on top and take second place from Young, Bailo then began to track down the #581. Bailo pulled out some impressive lap times but this wasn’t enough to reel Dijkstra in. Bailo finished the race in second place, qualifying third for the final. Max then started to pick up the pace and was able to pass the #101 of Jake Dyer. Inman then really pushed himself and set his sights firmly on catching Archie May, Inman’s lap times again consistently improved, with his fastest lap of 29.093 seconds being taken from this final heat race. Fergus Bluff the Team’s Youth Intermediate racer was back with the Team after missing the home round due to a school trip. It was clear Bluff was keen to get back on the bike and race, with a brilliant start to the day after taking the win in heat one from the middle row, leading from start to finish. The next heat would prove to be more challenging, Fergus was set to start off the back row with the #128 of Ted Wilkinson starting from the front of the grid. Ted was well on pace in the previous heat and had the advantage of a front row start behind him. As the green light appeared the riders set off, with Ted making a brilliant start but Bluff riding tactically through the field to grab second place by the time they crossed the line for the first lap. Fergus then began to lock Ted in his sights, but as the laps ticked over Fergus was just off Teds pace and couldn’t quite catch him. Bluff crossed the line in second place, 4.393 seconds ahead of third place Luke Gardner. Bluff’s final heat race of the day proved to be a spectacle. Leading from start to finish and showing absolute class and pace Bluff took the chequered flag 4.965 seconds ahead of second place Ted Wilkinson, who made an impressive last lap manoeuvre on the #159 of Luke Gardner to move grab second. But Bluff looked effortless and broke into sub 28 seconds with a 27.892 second lap, the fastest of the Youth Inters all day. With all his other laps in the third heat clocking in the low 28 second region. Fergus smashed it and qualified first for his final. 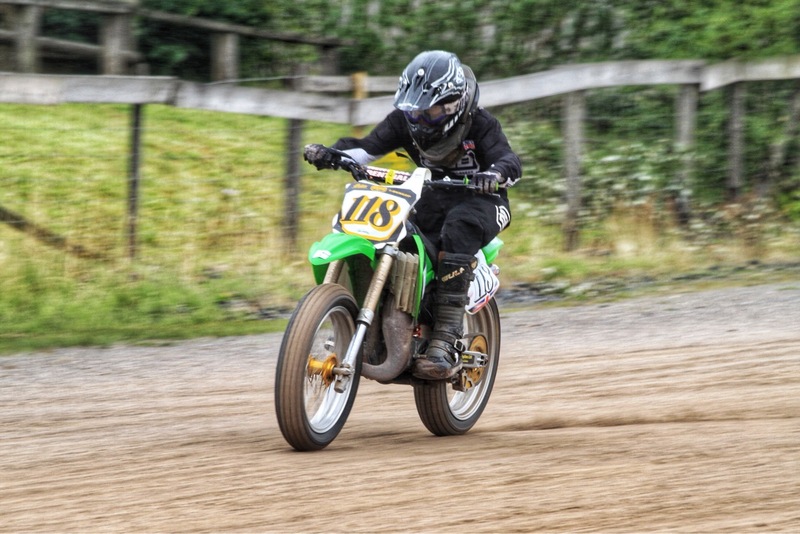 For the Team’s Youth Junior rider Toby Johnson, the half mile track was obviously daunting. 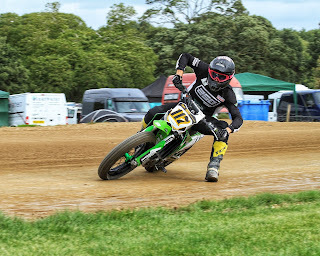 In his first heat race Toby saw it as an opportunity to just get to grips with the large track and take his time to adjust to riding a lot faster. For Toby’s next outing he had a lot more confidence and was noticeably increasing his speed, Johnson even managed a few passes. For his final heat race of the day Johnson was excited. After a great start Johnson was more on pack pace and showed confidence in increasing his speed down the long straights. As the final lap loomed the #36 of Maddie Banks was firmly in his sights, having caught her up enough on the last corner Johnson was well aware that by just increasing his speed he would be able to do enough to make a last second pass- and that is exactly what he did. As the chequered flag was in his sight Johnson kicked it up a gear and out of nowhere showed us all that he could pull that throttle back hard and make the pass down the finishing straight on Banks to claim fourth place. As Johnson rode back around to pull off the track, he was very clearly proud of himself, with a glorious fist bump into the air- we knew he was one happy chap. After some awesome heats races from the whole team we were disappointed as the weather continued to rage against us, with the misty rain turning into heavy droplets. It was then decided by the higher forces of the DTRA to draw the results from the heat race scores and to not run the finals over concerns for rider safety, in the increasingly poor weather conditions. Bailo finished the race meeting in third position, with Pickering right behind in fourth. Max Inman took third place in his class and Fergus Bluff took the win in the Youth Intermediate class. The forecast didn’t clear up and it continued to rain heavily throughout Saturday night, leading to the cancellation of Sunday’s Round Six. The next race meeting will again be held at the Team’s home track of Greenfield in September, but this time on the oval. Thanks to Paul France (@pegef) for the brilliant and fast turn around on photographs. 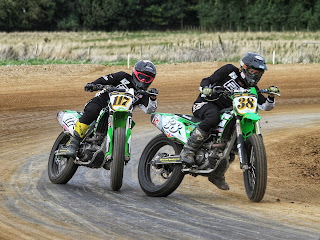 Round four of the Indian Motorcycle Flat Track Nationals, presented by the Dirt Track Riders Association, took place at Team Greenfield’s home track, the UK’s first ever purpose-built Dirt Track racing facility commonly known as, Greenfield Dirt Track. The July meeting at Greenfield was also the only TT race of the year, with the riders taking to the newly extended TT track. Like the meeting prior to Round Four the Pro’s and Intermediates took to the track for timed qualifying Saturday afternoon, with racing beginning at 6:30pm. 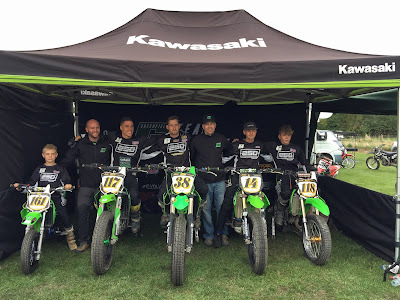 After two timed qualifying sessions both of Team Greenfield’s Pro riders looked very comfortable on their bikes, with Pickering qualifying third fastest and Bailo qualifying fifth. Local rider Toby Hales qualified fastest followed by Gary Birtwistle and Richard Mason qualifying fourth, just in front of Bailo. 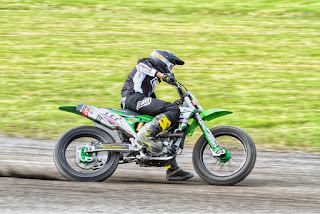 As the evening’s racing got underway the Team Greenfield riders dominated their heat races, with both riders winning their respective heats, allowing them to automatically transfer to the semi-final. The home crowd were in absolute awe as Team Greenfield owner, rider and Greenfield track builder, Pickering steamed over the line. The semi-final saw the Team Greenfield riders line up alongside one and other. From the green light Gerard Bailo gave a master class in TT riding, with his teammate George Pickering following him across the line in second place. It was a 1, 2 for Team Greenfield in the semi-final, the perfect outcome. The semi-final success earned both riders a front row start for the final, with Gerard taking first pick and George picking third. The fifteen-lap final of the Pro/Intermediate class was set to be the spectacle of the day, with two intermediate riders making the final, the TT certainly mixed the results up. 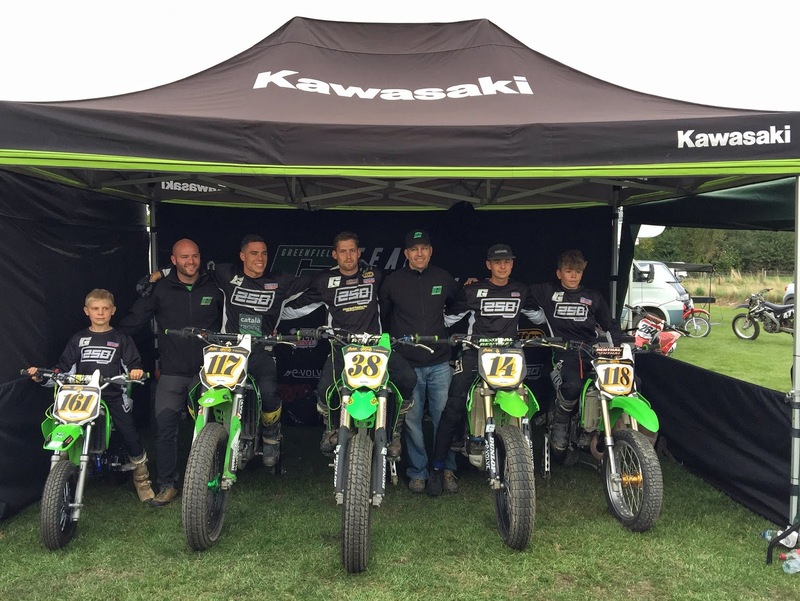 Team Greenfield’s chief mechanic, Steve Nichols, looked confident with both riders going into this final event. As the green light signalled Gary Birtwistle made an unbelievable start to lead Gerard Bailo coming out of turn one. Bailo relentlessly pursued Birtwistle, doing everything he could to put the pressure on the first lap leader. Bailo increased the pressure and forced his way up the inside of Birtwistle, on the right hander before the jump, creating space we didn’t even know was there. As Bailo zoomed past Birtwistle he began to pull away, he looked to be the outright favourite to win this race. But Bailo pushed himself too hard once past Birtwistle, he tried to create a gap immediately between him and the rest of the field, this resulted in him losing it and coming down in the first section of the TT. 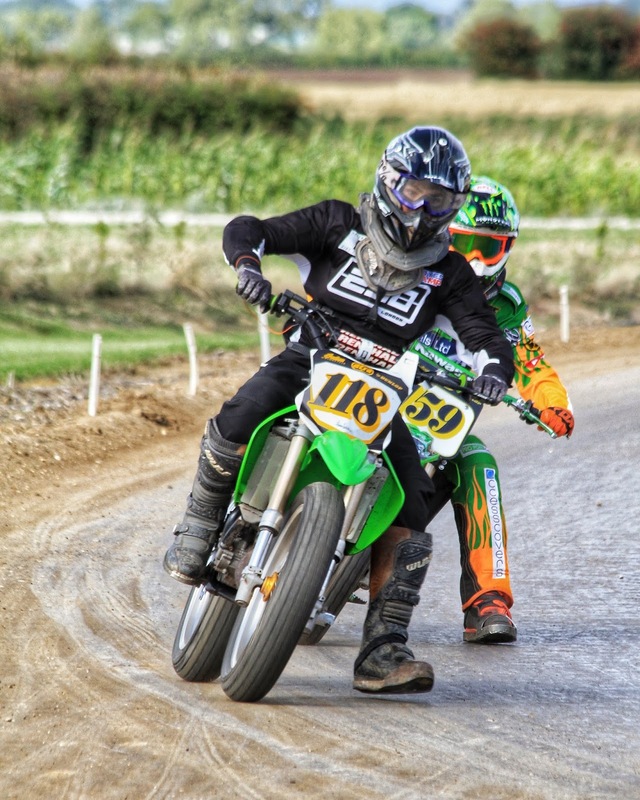 As the rest of the field went past Bailo, Pickering moved into second position as he rode defensively to hold off Championship leader Toby Hales and Richard Mason in the early stages of the race. 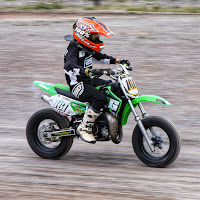 Bailo was able to keep his bike running and re-join the pack, by jumping straight back on. 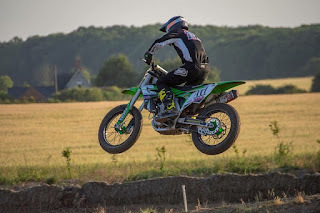 While Bailo battled his way through the ranks, picking rider after rider off, showing immense capabilities, grit and determination, Pickering was able to pull a gap on Mason and Hales who were in their own battle for third place. Once he stopped riding defensively Pickering focused on tracking Birtwistle down, who had pulled a significant lead on the rest of the field. Meanwhile, Bailo did the near impossible and made his way up to fifth position, where he had his sights set on Richard Mason. With only a lap to go Pickering was set for second place, with no immediate pressure he crossed the line behind race winner Gary Birtwistle. Gerard however crashed again, this time on the left-handed turn after the jump, but he had pulled away from sixth position that much he was able to quickly get back on the bike and not lose his place he had fought so well for. Crossing the line in fifth position Gerard Bailo had everyone stunned. The Youth Senior Class supported the Pro and Intermediate racing on the Saturday evening. 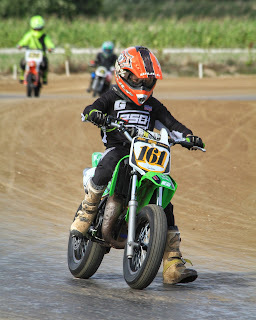 Team Greenfield’s Youth Senior Max Inman took to the track to race his first ever TT on his 250. 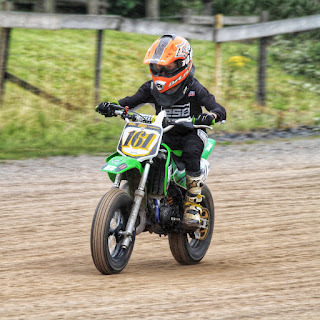 Max was so impressive Saturday night, after relatively little bike time he looked so confident on his 250 and took in his stride all that the TT track through at him. Race after race he looked so much stronger and more competitive, really taking on board all that was said to him. Max again showed that he was a quick learner and was really able to hang on to the pack to bring home third overall and securing his spot on the podium. Fergus Bluff the Team’s Youth Intermediate rider and other local lad was unfortunately absent from Round Four, due to other commitments. It was a great shame as he has shown so much confidence on the track and would have proved difficult to beat. We look forward to seeing Fergus back for Amman Valley. 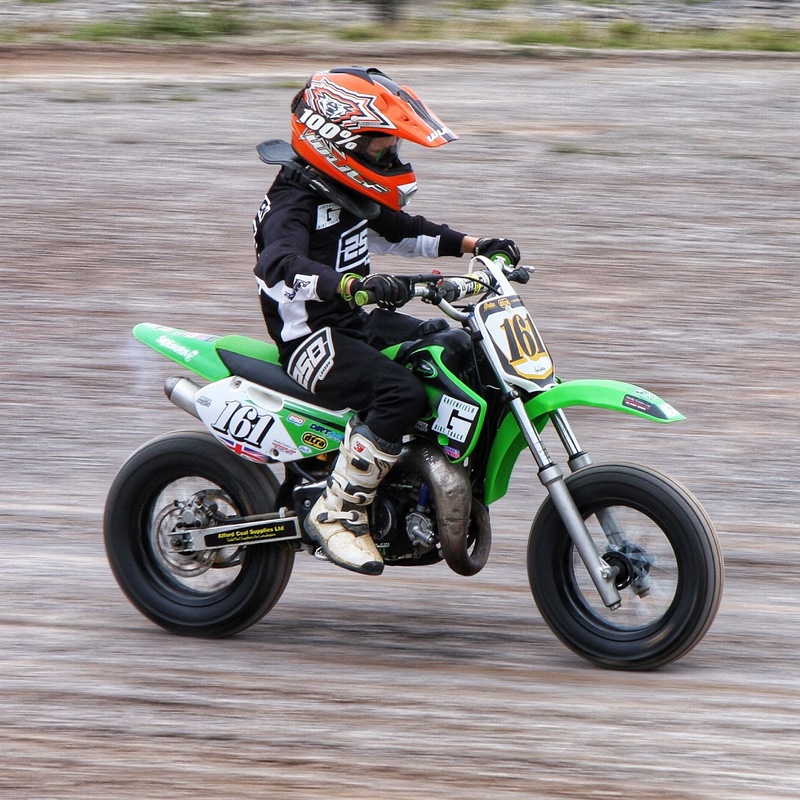 The Team’s youngest rider Toby Johnson was back out on track. Toby did a great job racing the TT. 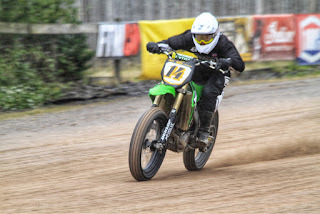 It was clear that his winter riding at the nearby Motocross tracks had benefited him for elements of the TT and it was great to see his clutch control massively improving. We look forward to seeing Toby continue to make improvements. The weekend was massively successful for all elements of Team Greenfield. To produce such a quality National meeting and to prep the track to perfection, the fantastic Team results were just the icing on the cake and it is fair to say that nothing could of gone any better. The true spirt of Greenfield really glistened over the meeting and none of it would have been possible without the countless hours put in by the whole team at Greenfield. Racing will return to Greenfield Dirt Track in September, for the final race meeting of the year on our oval Dirt Track. 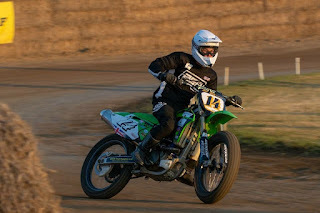 Thanks to Braking Point Images, Tim Holderness and William Hales for the Photos.